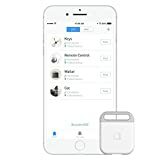 Tile’s various Bluetooth tracker devices are widely accepted as the all-around best Bluetooth tracking tags in the business. They are great, of that there is no question, but they’re also not without their shortcomings. The biggest problem pertains to the battery. It’s not that battery life is bad, in fact far from it — the battery in a Tile tracker can last up to a year. The problem is the battery can’t be replaced, so when the tracker dies you have to throw it away and buy a new one. If you’re looking for another good option, check out the nonda AIKO Finder. It’s rechargeable, unlike Tile’s devices, and a 4-pack on Amazon drops the per-unit cost to just $11.89. [Easy Setup & Intuitive App] Download free iOS/Android app with short video tutorials. [Find Your Lost Items & Phone] Tap ‘Find’ on AIKO App to make AIKO beep. Double press AIKO device to make your phone ring. [What’s Included] An AIKO device, a micro USB cable, a user manual, one-year warranty, efficient customer service(2017 The Stevie Awards Winner).